No, this isn't a post about music... though the title would suggest otherwise. This is a post about finding your rhythm. You could translate that into everyday life OR blogging. I've been noticing a pattern in myself: anytime I go through a big change, I have a hard time finding my footing. When I found out I was pregnant last year, it was unexpected and sort of shook my foundation. It's not that I didn't end up being terribly excited about it, it was just something that was creating a huge change in my world. Now while we are settling into this house (which is a temporary situation, but more on that another day), I'm finding it difficult to slide back into my daily routines AND blogging routines. I currently feel a lack of focus, motivation, and organization. I WANT these things, and I don't lack the drive... it's like I can't make myself focus enough to achieve them. Part of that is this busy time of year, but I know the other one comes from being a bit of a creature of habit whose familiarities have been turned upside down. There are ways to cope with this. Right? Of course. Being an adult is all about learning to cope with uncomfortable situations... or I should say MY adult life requires a lot of learned coping techniques. Lately I have been writing things out even more than I used to. I know a lot of you are list makers so you're like "what? I already do that." I mean EVEN MORE lists. My phone notes and notebooks right now are showing my crazy side just a little. It's helping me stay on track for the day, return emails in a more timely manner (whew), and reminding me to feed myself at appropriate times so I don't get too hangry. Saying no when you need to. This is something I've been practicing for the better part of the year and it's still hard! I am the great over-extender and it makes me miserable sometimes. Are any of you like this? Am I the only crazy out there who over-extends herself to the point of absolute exhaustion?! That was a rhetorical question. Of course I'm not. We all do it and we need to get better at taking care of ourselves... oh, and taking care of yourself is NOT a selfish act! (There's that guilt again.) I'm not very nice or nurturing when I've had 3 hours of sleep and I feel like I'm carrying the weight of two worlds on my shoulders. No one in my life is being properly loved when I'm like that. No one benefits. I appreciate this post right now:) I had a baby two weeks ago (my second child) and I feel like I have been knocked to the ground. The last two weeks have been the most overwhelming I have ever experienced and Ive had to give myself permission to not get everything (if anything) accomplished each day. Im slowly adjusting to a new normal and trying to give myself as much time as I need:) Its nice to know Im not alone in coping with changes! I have been feeling the exact same feelings like you are feeling right now. But I am used to it, because that is exactly who I am supposed to be. I also learned to love it! But I am still learning to say no and probably I am not going to make it, but hey, maybe it is supposed to be like that. Life is too short to worrie, I love what I do and i do what i love. Well your not alone...there are so many of us women out there that deal with those feelings. We like to take on to much and feel guilty when we can't do the impossible. Im only staring out in the craft business and I feel the pressure. I can't imagine what you successful ones go through. So I will try to take your resolution too and to adopt a slower attitude! Thanks for you're lovely blog! It's always a pleasure to read you! When I read this, I though - wow, so I'm not the only one. I'm as well trying to be as much responsible and an adult in my life, but when it comes to changes, I'm always terrified like a little girl. And it's not that I don't want this chane, I'm just so unsure about the future. It's hard to be grown-up, and age has nothing to do with this. Give yourself some time to adjust and it should get better. Wish you luck and strenght ! This post really struck a chord with me! I am definitely going through this at the moment. While I'm not going through anything as life-changing as a baby, I have just finished University, and finding the transition from that to full-time working life (especially at this time of year) is very challenging. Thanks for yet another great post, love your work! Gosh, I feel this way sometimes and I don;t even have kids! I feel like (since I'm starting my own business) I'm always working, always worried about what to do next, and it's like I just can't ever get it right! I have found that if I prioritize the lists it is very helpful with the guilt factor. I have "must do" items like pick up children, doctor's appointments etc. Then I have ongoing projects which I allow myself to check off if I've worked on them at all. Last there are things that sure would be nice to get done but aren't earth shaking. Your blog is so lovely. If you do other things as well, I'd say you're doing fabulous! Great post. Saying no to friends and loved ones is very hard for me as well. I always feel guilty if I do. And most of the times I catch myself putting others happiness infront of my own. Thanks for this post, Katie. The quote pic looks a lot like the ones from Jessica of Vol.25. as we all are darling. it's good to know that none of us are alone, in what we want, expect, & actually can be. i usually always find me at the opposite side of discussions like these. i'm the furthest thing from a creature of habit. i get bored ridiculously easy, and crave change like nothing else. for me, when i'm dealing with a lack of focus and motivation, it's because i've found myself stuck in a routine... and i'm the least productive thing ever at times like those. to each their own, i guess, right? I used to think being an adult meant having it all figured out, and being able to wisely and calmly deal with all issues that come your way. The day it dawned on me (totally out of the blue, as I was walking to work) that this was not the case was a huge relief of sorts. While it hasn't made any difficult/stressful situation any easier, really, it is a comfort to know that everyone goes through similar insecurities, issues, situations and stresses that make life rough. I know have you feel Katie. I'm 27 years old, no kids though, but married, done with school, have a job, and now I am supposed to be all grown up. My tips to you: This is your life, and if you are unhappy figure out why and make small changes. SMALL changes! You only have one life, so live it to the max and don't regret a n y t h i n g!!!! Hey lovelyface...excellent timing. I was just telling Logan last night that I feel like my whole life is a series of to-do lists at this point...everything is work to do later, personal stuff to do later, things to read later, movies to watch later, etc etc. I feel like I don't have time for anything and the lists just keep growing! Bah. But we'll make it through!! :) ONWARDS AND UPWARDS! Adult work in progress - I so have to remember that. I always feel like I should be doing more and I constantly have to remind myself that taking care of me isn't selfish - it's a benefit to my family. Glad I'm not the only one. Being a grown up is so hard! It is very rewarding but at times feels so overwhelming. I find the whole money and working thing stressful.... And debt. Well there are times when I just have to say ... Breathe! And be positive and grateful. Ps- I love reading what others have written in your comments - it's inspiring and comforting. We are all just learning and doing the best we can. Your post is incredibly timely. I'm wrapping up my first semester of grad school and let me tell you- it's been a huge challenge. It's not that I didn't have the desire to do well and work my tail off, but every time I tried, I could NOT focus! 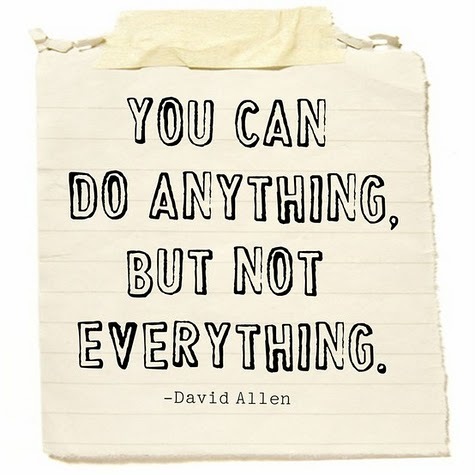 I don't know the image source, but that quote is from productivity guy David Allen. He wrote a great book called Getting Things Done. You should check it out of the library if you've never read it before. Whenever I'm feeling overwhelmed I take another look at his book and try to get myself re-focussed. Matter of fact - I think I need to do that right now! I totally have "the world will end if I say no" syndrome combined with a touch of "if I push myself just a little, I can fit it in." Nope. Doesn't work. I totally agree with this whole post! As a musician who constantly has projects thrown at me, I've worked really hard over the last several years to say no and take care of myself. Even though I still slip up, it's been great and everyone seems happier! For the most part I eat enough, sleep enough, relax enough, and still get a ton done. The best part is, in the end even though I might not get everything done, I'm more of the person I want to be. Quality is always better than quantity. Great post. I often feel the same. I'm loving all of these comments on this post! Thank you all for taking the time to share your perspective!!! great post, katie. i feel the exact same way during periods of transition. i started a new job a month ago and i'm still trying to settle into a new rhythm. good luck! I could have written a lot of this. xoxo Hope things get back in place for you soon! really helpful post! i'm not alone in this situation! thank you for sharing! "I've also been forcing myself to stop feeling guilty when I can't complete everything I intend to"
Oh, yes! Sometimes I even end crying of tiredness and impotence. Last week I readed Momo for the first time and it really made me think about the actual world where we want to achieve the more the better, feeling guilty for taking a little time to enjoy, rest or simply live! A friend directed me to this post - thank you for sharing. I'm taking some steps toward making some big changes, and have been feeling exactly the same way. I didn't know what was wrong with me, but this is helpful and encouraging. Thank you! Hi! I came across your blog through Sometimes Sweet and I would just like to say that your blog is amazing. You have a lot of creative things going on and your posts are very inspiring as well. :-) I like your style and the way you just express your feelings. Thank you for sharing this lovely post. i feel ya! i have a newborn and a kindergartner and the balancing act is killin' me! plus, transitioning from a full time cubicle job to a stay-at-home-mom is insane. i love it, but it is definitely taking some getting used to! thanks for the awesome and honest post! Perfectly said. I completely relate! I'm so with you girl!!! You are so right! Wonderful post, so so true and so so common. Wow. I really needed to read this today. It's good to know I'm not alone in my natural inclination to always overextend myself. Totally understand where you're coming from here, and I have definitely been there too. I think sometimes we all need to cut ourselves a little slack and realize that it's hard for everyone, in their own way. Maybe not today, or this week, but everyone goes through these same thoughts and feelings too. With all that said though, I hope your spirits have perked since writing this post. Katie, today is the first day that I have stopped by your blog. 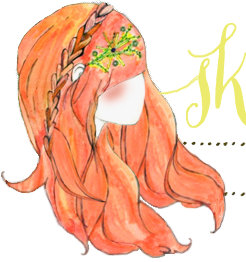 I follow Elsie's blog A Beautiful Mess, and thought I would stop by after see your holiday hair tutorial. I absolutely love browsing through your little creatures and admire what you do. As I read this post I felt as if I was reading a letter to myself. You are most definitely not the only one! I am only 17 years old and have already experienced this. I am always in a rush to get somewhere without knowing where I want to go. I graduated high school a year earlier, work two jobs and am currently taking 20 credits a term at the local community college. Agh! I can't wait until I have a family, too. Your post is inspiring and has helped remind me to slow down and smell the roses (?) (Is that a/the saying?) Ha:) I wish you the best! Have a happy holidays. Yup, this is totally me too. Totally. (In the run up to our wedding, I kept repeating that phrase to my now husband!) I love the idea of judging a person by a child's standards!